A two-piece aluminum frame requiring welded assembly contained multiple pieces of inserted hardware was brought to Ultra to redesign. The list of concerns with the current design was growing and it needed to be addressed before costs increased further and quality continued to suffer. The welded assembly wasn’t strong enough to stop leakage problems from occurring. Inconsistency was making hardware insertion difficult and timely. Forming the aluminum frame was challenging because of its inherent softness. Collaborate with Ultra to create a progressive die that would produce the part without assembly to reduce costs and improve accuracy. 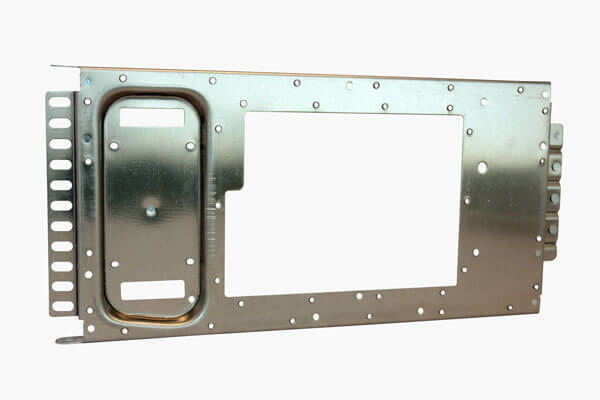 First, a form analysis was completed to establish the manufacturability of the proposed one-piece design matching the frame’s dimensions – 27” long x 12” wide. Then various grades of aluminum were tested to identify the specific aluminum that would be strong enough for the new design. This included shock and vibe tests on the different types of aluminum until the results met the customer’s standards. This entire prototyping process ensured the frame could meet its performance requirements in the final product. Second, we designed and built a progressive die to support this new one-piece design. Throughout the prototyping we utilized our fiber laser to cut different strip configurations and fine tune the die design to eliminate wrinkles. Third, to improve accuracy and productivity during hardware insertion we utilized our Pemserter. This equipment has the capability to insert all the required hardware including three different types within one-set up. This redesign created a more efficient manufacturing process that led to lower costs and improved the overall quality of the frame. Prototyping provided 100% assurance that the frame would function hassle-free in its designed location. The customer selected Ultra to redesign their even larger frame – 35” long x 17” that had a similar shape and hardware insertions.